The Stanford Croquet Set from Garden Games is a great value, entry level complete croquet set. This set includes mallets and balls of different sizes, enabling all the family to play together. The Sset contains full sized powder coated, long lasting metal hoops, offering a challenge for adult players while allowing children an easier more fun game! 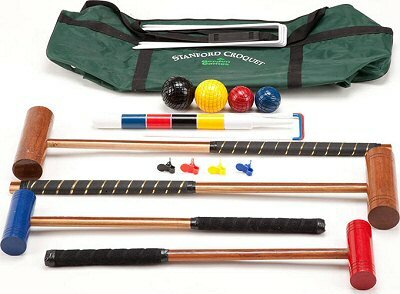 This fantastic family croquet set comes contained within a handy canvas carry bag with carry handles and shoulder strap. The Stanford Family Croquet Set is perfect set for the garden or family gatherings. Comprising of 2 full sized adult mallets and 2 smaller brightly coloured children's mallets with the heads of the childrens mallets painted red and blue with matching balls (2 x full sized 2 x smaller 7.5cm diameter 6.05 oz childrens balls). 2 x Oval spliced wood shaft hard wood head mallets with a leather bound grip 37 1/2 inches in length. 2 x Wooden childrens croquet mallets with Red and Blue painted heads and fabric grips for comfort. Each mallet is 78.5cm in length.